The ability to show the George Pell sexual assault sentencing LIVE led to some interesting editorial choices by the commercial networks, but most users on social media agree Channel 9 made the wrong call. It’s unusual for networks to be able to plan coverage ahead of time, news is usually about making decisions on the run as events unfold in real time. With the sentencing of Cardinal George Pell, who had been found guilty on five charges of “historical child sexual offenses” that go back decades, network newsrooms had time to plan their coverage. It soon became obvious that hours of preparation had gone into the coverage with Seven, Nine and 10 coming out of the gates with a sprint. All three networks had reporters on the scene outside the courtroom, with Seven hosting their coverage on location. Seven were first on the case first as Chief Judge Peter Kidd started his opening remarks. All networks were provided with a pool feed of the judge with just one camera allowed into the courtroom to supply his comments to all networks LIVE. A view of the commercial TV coverage of the George Pell sentencing in the McKnight Tonight studio. “We’re going to leave his remarks there, in part because he won’t sentence Cardinal George Pell probably for nearly another hour. Also, he will go into some pretty graphic details about the crimes, so we’ll pull away from there now”. While I don’t agree with the idea of pulling away from the coverage, I respect the fact producers made an editorial decision regarding the graphic nature of the content. There is also the argument of supplying alternative programming, a position Channel 10 usually takes when it comes to news events due to the dominance of Nine and Seven. For Nine to take this position is rare and unexpected. After cutting away from the sentencing, Channel 9 viewers were treated to 6 minutes of reporters talking about the sentencing hearing they weren’t showing! Christine Ahern was at the Melbourne Assessment Prison where Pell was being held talking about him leaving the venue earlier that morning, Dougal Beatty was outside St Patricks Cathedral where the abuse took place and Michael Best was at the Vatican. It was quite bizarre to spend 6 minutes talking about an event that Nine was actually showing in the bottom right of the screen. I just couldn’t fathom it. After a commercial break Carla Bignasca and Brendan Jones joined David Campbell and Sonia Kruger to give their take on the news events of the day in a ‘Hot Topics’ type segment. This was followed by an advertorial. At least if Nine weren’t going to continue their coverage they were still bringing in some revenue. BUT THEN, a change of editorial policy as Nine went back to the Pell sentencing and stayed on the judge. It was a double backflip with style considering Burrows had earlier told viewers Nine had made the decision to pull out of the coverage as the judge would “go into some pretty graphic details about the crimes”. Social media had been ferocious in regards to Nine’s coverage, which could have led to the change of heart. Nine have absolutely and inexcusably dropped the ball here. TV Blackbox has access to live ratings data from Fetch TV. 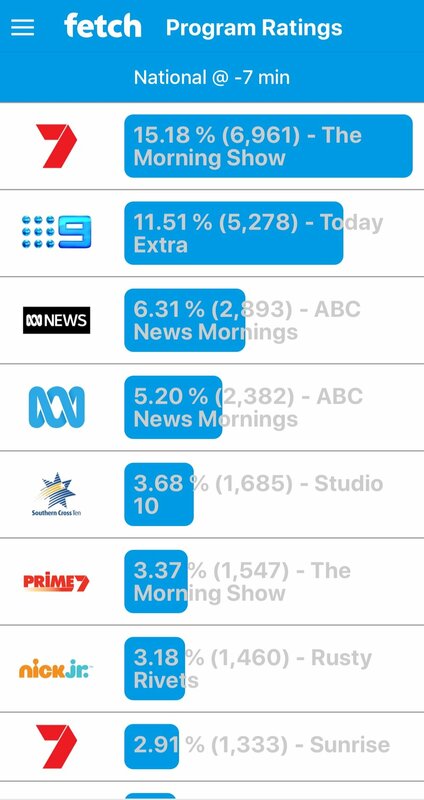 The app we have allows us to monitor what people with Fetch TV boxes are watching at any given time (it doesn’t share individual usage, just overall figures). Our data showed that once Nine stopped showing the sentencing, viewers started turning off. Seven’s coverage throughout the sentencing was top notch. They had planned it out carefully and added great production to the pool feed camera, providing boxes to show a mixture of file vision and live pictures from outside the court. Studio 10 did well by showing the pool feed (and full marks to them for staying with it the whole time), but there seemed to be a lack of planning in regards to the production side. At one point they decided to add an insert box, which appeared on the right of screen, only to change their minds and move it to the left of screen. Once Nine resumed their coverage it was flawless as you would expect. Their presentation style is top notch and they would have been clear winners if they had covered the whole speech from Chief Judge Peter Kidd. TV Blackbox understand Darren Wick, Nine’s Head Of News and Current Affairs, is still in hospital recovering from hip surgery so wasn’t on site to offer advice during the live coverage. ‘Wickie’ is an old hand at rolling news coverage and has great instincts. There’s no doubt Australian’s are spoilt for choice when breaking news happens. Our producers and presenters are amongst the best in the world and we always deliver quality coverage, even if sometimes the odd bad call is made.